WEST COCOA, Fla. —A 6-year-old boy is still in the hospital Monday with his family by his side, after a pit bull attacked him and ripped open his scalp over the weekend. The child was bitten by a neighbor's dog in the neighbor's yard, sheriff spokesman Cpl. Dave Jacobs said. Neighbors said the dog has been a menace in the neighborhood. Javien Edwards, 6, was airlifted to Arnold Palmer Hospital for Children in Orlando after the attack in his Cocoa neighborhood. "A neighbor said his scalp or his skull was showing. Yeah, I think it was up here," said Cleo Woods, Javien's grandfather. "He's in stable condition, and we're just requesting continuing prayers for his recovery," said Tyaka Woods, Javien's aunt. Family members said Javien was playing in the yard where the dog lives when the attack occurred. "It's really tragic, because the dog is a neighborhood nuisance," Woods said. A nearby resident said she's been afraid the dog will attack her elderly mother. "It charges the gate. So she walks with a stick to make sure that if he does get out of the gate, she has something to protect herself with," said neighbor Pam Hall. The dog is now in a shelter, quarantined. The Brevard County Sheriff's Office is investigating whether the owner will be fined. A serious bite from a dog can result in a $500 fine. If the dog is ruled dangerous, it could be put down. The dog's owner has the option to turn it over to authorities, or to keep it. Keeping a dog that's declared dangerous requires secure fencing and extra insurance. Cocoa, Fla. (WOFL FOX 35) - A 6-year-old is at Arnold Palmer hospital in stable condition Sunday night, recovering from a dog bite. 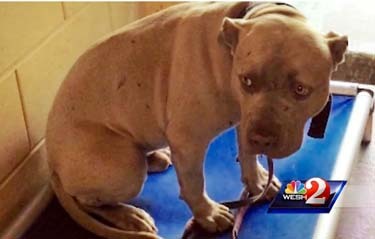 Brevard County Fire Rescue officials said via Twitter that the child was bitten in the head by a dog in Cocoa at around 5:30 p.m. Sunday. Fox 35 was there as Brevard County Sheriff's animal services was on scene. The people inside the home where the incident happened offered no comment to Fox 35. A woman who says she is a cousin of the child says the 6-year-old was invited to a neighbor's house to play with children on a trampoline at the home. The cousin said the dog attacked the child, and she watched as the child was put on a stretcher with his head wrapped up. Brevard County Fire Rescue tweeted they have no information on the type of dog, BUT NEIGHBORS AND SEVERAL OF THE CHILD'S FAMILY MEMBERS SAY THE DOG IS A PIT BULL. A 6-year-old child suffered serious injuries from dog bites to the head Sunday, the Brevard County Sheriff's Office said. Jacobs said while the injuries are severe, they are not life-threatening. Brevard County Fire Rescue tweeted that the child was bitten on the head. The child was flown by helicopter to Arnold Palmer Hospital for Children in Orlando. Jacobs said other details of the dog bite were not available. The dog was "SOME TYPE OF MIXED BREED", and no one else was injured.